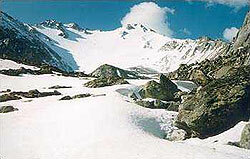 Mountaineering as a particular sport was started in Eastern Sayan in late 60-s. The alpine relief with rugged ridges, pristine beautiful lakes and real wilderness attracted people from former Soviet Union since early 60-s. The Range was very popular among backpackers, who made the first description of the area and its passes. Elevations were made to some tops as to see panorama and make photos. First climbs and ascents were made by people having little climbing experience, without good special gear nor ropes. In 1969 great Soviet mountaineer Abalakov came to the region by invitation of Irkutsk regional Association of Alpinism. Abalakov committed several ascents to the tops and made technical descriptions and classifications of them. Since that time Tunka Range was included into Classificator of Summits of Soviet Union, and a new mountaneering area was officially born. Since the Range was considered as a sport climbing district, first classification was done for technical climbs only, missing high altitude elevations, cause the altitude of the Range is just about 3000 m and there are no glaciers. In general, the routes in Sayan Mountains are classified lower than in Middle Asia and Caucasus because of the lack of ice fields and ice faces, though technically routes are more difficult. Due to rather high tree line (approximately 2200 m for Southern Exposure) the approach to the tops is not long and the whole elevation can be made in one day from the base camp, except the most technical routes. Base camp usually is set on the border of tree line. Hard granite and limestone faces require good climbing skills, quality gear and resolute character joined with good balance and sense of humor. In late 80-s after the start of Perestroyka and desintegration of the Soviet Union former main mountain areas became territories of sovereign states. Since then a great interest for Sayan mountains took place among Russian mountaineers. More and more people from Western part of Russia use to come to Tunka. Rock faces with multiple obstacles as iced chimneys and cornices make a good test for anyone's climbing skillness. In our days technical routes up to 5b class are set in Tunka range. Mountaineering season begins in the end of October ( behind the 20 th day of the month) after first severe frosts and snow, as "live" rocks and stones get frozen. The weather in October is usually fine and shiny, after first frost it gets warm again. The coldest days and nights fall on 6th and 7th November, when the temperature runs down up to 30 degrees below zero (Celcium). By March numerous waterfalls in canyons cover with thick ice and turn in icefalls, so it's great time for iceclimbing. In cirques snow gets very thick too, and all the routes are complexed with prolonged snow fields and crusted snow on ridges. The best time for mountaineering is the beginning of May, when it is not so cold yet all the peaks still covered with snow and ice. In common the weather in Sayan is rather changeable as in most mountaineous countries, it may snow even in July. But the closeness to inhabited points of the valley, good transportation connection and excellent mineral waters of resorts makes the district very attractive for climbers. Rock climbing as a particular sport is not much developed, though conditions of the area are excellent.